February’s RPG Blog Carnival is being hosted over at Arcane Shield and this month the topic is to simply pimp that game you love, the system you come back to time after time. For me the choice is simple. Cortex. 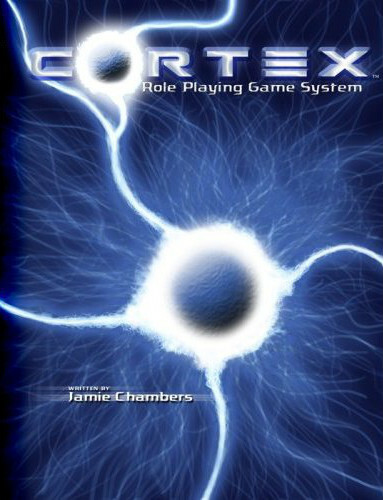 The system has already received some love from The Chindividual where he shares his love of Cortex Plus (which powers Smallville, Leverage and Marvel Heroic). But that’s not the version I want to focus on, no the system I want to focus on is standard Cortex, which was used for Serenity, Battlestar Galactica, Demon Hunters, Supernatural and the generic Cortex System. But why do I love it so? Well first off it is simple yet highly versatile. The core mechanic sees both attributes and skills defined as a particular sized die (with bigger being better) with rolls constructed by rolling the required attribute + skill then adding up the total. So it’s extremely simple to learn the basic system, but what about the versatility I mentioned? That arises from the fact that skills are not linked to a single attribute and can instead be matched up as required. As an example lets imagine an investigator PC who has just arrived at a crime scene and is looking for clues. If they’re just having a simple look around then they might be asked to roll Alertness (Attribute) + Perception (Skill). In doing so they observe that the room appears to extremely secure, so they’re wondering how the criminal might have gotten into the room. The GM, therefore, asks for an Alertness (Attribute) + Covert (Skill) to see if the PC can spot that the window has been rigged to allow it to be opened from the outside. Now knowing how the burglar got in the investigator is wondering what was the reason for the break in, so they make a final roll of Intelligence (Attribute) + Perception (Skill) to see if they can deduce why the room was targeted based on its contents. The same concept goes for any roll that is called for, adapting to suit the situation as it evolves. The simplicity and versatility aren’t the only reasons I love the Cortex System. The variable size of the dice means that its difficult to play the curve and predict your chances of success while the inclusion of these dice to roll defence scores means that even a low level character has a chance if their opponent rolls badly. Absent is the issue of low level NPCs who can’t harm the party or PCs who can’t get a lucky shot on the big bad evil guy. At it’s base characters are not the great hero’s of D&D or Pathfinder, this is a system where PCs are as fragile and as fallible as everybody else in the world without falling over the moment they take a single wound. As a GM more interested in near future and Sci-Fi settings than heroic fantasy this balance is ideal for the stories and settings I prefer to employ. This isn’t to say that mechanisms to pull off spectacular successes are absent. The advantage system provides quick bonuses that, depending on your genre, can either boost skills (providing relatively small bonuses) or add additional dice (allowing for extraordinary feats) while plot points (akin to bennies in Savage Worlds) allow for the boosting of rolls in tense situations (and unlike Savage Worlds are provided in sufficient quantities during a session that you don’t need to save them just in case you need to soak damage). Again, simple yet versatile. I’m not going to lie and pretend the system is perfect, the Battlestar Galactica and Supernatural variants for example were little more than reskins of Serenity with little work done to adapt the rules to the genres (something Cortex Plus does superbly). I hope however that this little blog post will have tempted you to give it a try, the generic rules set (and a few of the other variants) can be found on DriveThruRPG and at $4.99 (at present) it’s an absolute bargain. Heya there! Thanks for referencing my post, and it’s good to see some more love for Cortex (no matter the version of the system). Also, great to see another fan of the different dice sizes used in the rules. Skewed odds for the win!